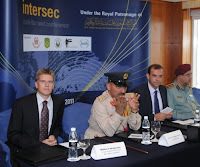 security, homeland security and policing, safety and health, fire and rescue and aviation security in the wider region. gear and equipment in the region is on a strong growth path. “While no one can guarantee 100 per cent security, being prepared for any eventuality is vital,” said Major General, Dr.
drills accordingly will empower us with the expertise to meet any challenges,” he added. and government agencies, legislators, suppliers and service providers. Occupational Safety and Health (IOSH) and Secutech . together to ultimately achieve that goal,” he added. tactical deployment methods and the Exhibitor’s Experts Forum.